Low power, high speed binary multiplier is an essential component of digital computers. Many architectures of multiplier based on Booth multiplication and array multiplication algorithms have been implemented. The array multiplier using Wallace tree structure is reported to be fastest and requiring minimum hardware. The speed of a binary multiplier is dominantly determined by the speed of adders used in the multiplier. This work describes a new 20-transistor low power high speed hybrid CMOS full adder and a new carry skip adder suitable for use in multipliers. 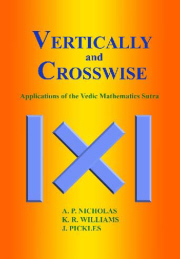 A new modular design method for design of n x n multipliers using Vedic algorithm for multiplication has been proposed. The proposed design method uses more number of gates than array multiplier using Wallace tree but offers the advantages of simple and systematic interconnection scheme and maximum design reuse. When doing the search that found the above book, it became apparent that there was a lot of similar research papers discussing similar material.